Refined sugar is a recent addition to the human diet. For years, eating too much sugar was a precursor to tooth decay, cavities, and tooth loss. In only the last 50 years, sugar has become an ingredient in thousands of processed foods even foods that don’t taste sweet. We know sugar is in soft drinks, candy, cookies, cakes, and breakfast cereals. Sugar is also found in breads, crackers, pasta sauce, and many other foods we don’t associate being sweet. Refined white sugar and other forms of sugar are on the foods to avoid list of many diets. The problem is not so much that sugar is bad it is due to the fact that Americans eat too much sugar. Average per capita sugar consumption in the United States has increased from 110 pounds in 1950 to 156 pounds per in 2012. That is a 30 percent increase equal to nine 4-pound bags of sugar or 64,800 calories. That averages out to 177 calories per day or about one 12-ounce soft drink. Most of the sugar comes from various forms of added sugar not naturally occurring sugar in fruits and vegetables. Unlike fruits and vegetables that have fiber that slows sugar absorption, refined sugar is found and consumed in hundreds of foods combined with refined white flour and very little fiber. This results in blood sugar spikes that can increase hunger, increases demand for insulin, and can increase weight and risk for diabetes. Eating too much refined sugar has been linked to increased risk of dying from heart disease even for people who are not overweight (study published in JAMA Internal Medicine in 2014). Sugars are rapidly digested and absorbed which cause blood glucose spikes. Flooding your blood with sugar places a load on your pancreas to produce insulin to remove the sugar. When your pancreas can’t keep up with the demand to remove sugar, your blood sugar level rises increasing your risk for diabetes. Sugars increase inflammation throughout your body. Increase brain dopamine in the brain. It is the dopamine high that causes you to crave and eat more sugar to maintain that high. Like other additions, there are serious risks maintaining the addiction. What was once thought to only cause tooth decay and obesity is now known to increase your risks for a host of serious diseases. The American Heart Association recommends women limit added sugar to 24 grams (6 teaspoons) per day and total sugar, natural and added to 48 grams (12 teaspoons). For men, the recommended limited are 36 grams (9 teaspoons) of added sugar and 72 grams (18 teaspoons) of total sugar. Nutrition facts labels list total sugar (natural and added) per serving. Be forewarned, food manufacturers like to minimize portion sizes to make their products appear healthier than they truly are. For example, a breakfast cereal may have 10 grams of sugar in a 3/4 cup serving. Eat 2 or 3 cups and you have 27 to 40 grams of sugar. It can add up quickly. Manufacturers add a lot of sugar to foods just like they add salt. When you sweeten your own tea, coffee, cereals, oatmeal, and other foods you will most likely add less sugar. 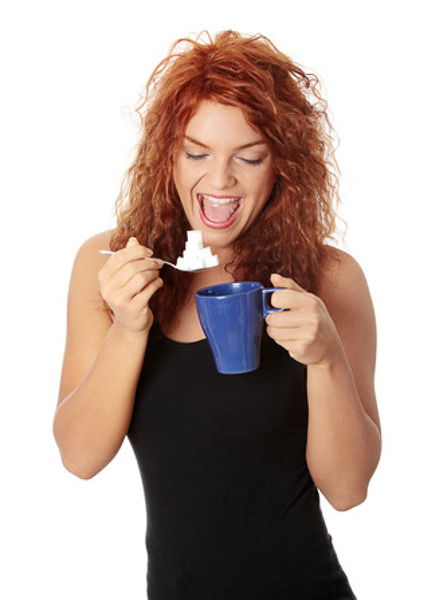 The model in the photo below may love sugar in her coffee. But 10 lumps (about 7.5 teaspoons, 37 g) per cup is going to add weight fast. Like cutting back on salt, you can use spices like cinnamon and nutmeg to flavor foods instead of sugar.